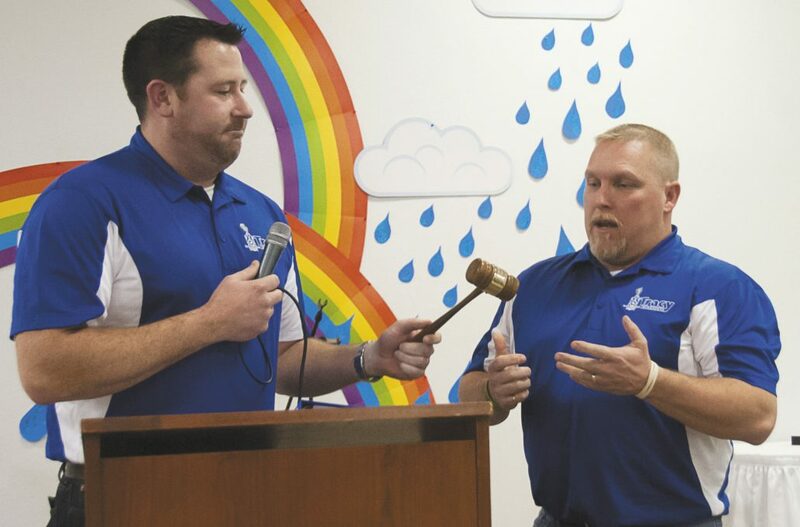 GAVEL PASSING — Outgoing Tracy Area Chamber of Commerce President Greg Carlson (left) hands the ceremonial gavel over to new Chamber President Khyle Radke during Saturday night’s annual Chamber banquet. Mother nature was not invited to Saturday’s Tracy Area Chamber of Commerce banquet, but she was definitely a topic of conversation. Framed appropriately by a background that blended raindrops and rainbows and which was created by Jesse James and Casey Schmidt, first-year Chamber Director Lexi Erickson dedicated the evening to the community of Tracy and the resiliency its residents showed after the July 3, 2018, flood. Erickson, who took over the director’s position in October, gave special recognition to the work done by the Tracy Fire Department, city employees, Tracy Ambulance personnel and the Tracy Police Department during the flood. Erickson noted that the weather wasn’t just a factor in July. It also affected a number of major Tracy events, such as the annual Women’s Expo that needed to be rescheduled, the car show that was relocated and, last but not least, there was Box Car Days. Erickson, who bemoaned the cancellation of the annual parade, thanked Box Car Days Committee members and her predecessor Brittany Larson for all their work in putting on last year’s 91st annual event, as well as the Halloween Parade, which attracted more than 400 trick-or-treaters. More than 20 businesses, individuals and organizations helped that evening by handing out candy to the kids. Erickson also thanked Chamber board members, and the police and fire departments for their work putting together the holiday Parade of Lights. See this week’s Headlight-Herald for more on the Chamber banquet.